The cold winter months can be enjoyed totally if you have decided to build a fireplace for your home. These days you have multiple options with fireplaces and besides enhancing the ambiance of your home, they can provide the warmth which works out really valuable in the cold winter months. 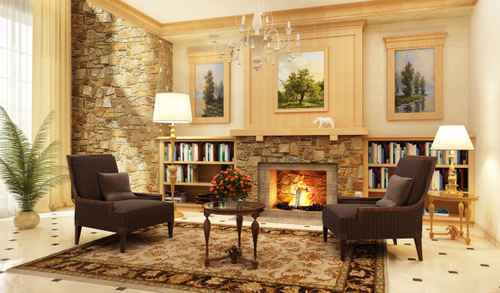 Moreover a solid and well-carved fireplace also increases the resale value of your old house. Since there are multiple options you can make your choice keeping the price factor in focus. There are multiple services which offer a professional heating contactor, customized designs for mantelpieces and also glass enclosures around your fireplace, to enhance the decorative charm of your interior. This might work out an expensive option but is one of the most impressive-looking and attractive option. A masonry fireplace consists of a stone or brick firebox, a chimney of brick or stone, and very often a mantel made of wood. This can be built easily if you are getting your house constructed though it does work out also for a house that is already built but you need an extra effort to install this. You need to make sure which room you would like the fireplace to be in and ensure the reinforcement of the floor joists as both, stone and brick are heavy weight. You need to remember that to build a fireplace you need a good quantity of floor joists for which you might have to modify the framing of your house in accordance with the building codes. You can say that these zero-clearance fireplaces work out much more reasonably and they are easier to install when compared to the masonry fireplaces. They are easily offered by fireplace construction services, as these require less masonry work. You find that these have firebox enclosures that are always cool and are also lightweight and that can be placed on any hardwood floors directly with just a few inches from the wall. These seem to be apt for rooms of any size, more so for small rooms due to the convenience and comfort of installing them. You can easily consult the fireplace construction experts to get this installed in your home or in your garden. What to look out for while you are consulting fireplace construction services? You must check whether they are registered and certified by competent building authorities, to carry on the construction of fireplace. They must chalk out an exit plan and an emergency outlet in case there is any accident caused due to fire. You must contact them after measuring the area where the fireplace is to be installed. The size of the fireplace can vary from normal standard units to large ones. The gas supply or the catalytic converter must be checked thoroughly if you are opting for the gas fireplace to be installed in your home. You have to ask the company individuals whether they will provide accessories, maintenance services, repairing and restoration of chimneys. With multiple options being available these days, what you need to look for is a company which can advise you right on which fireplace can work best for your home and install the same without causing you any tensions. There are a number of companies offering their services and you can search for them easily on the internet. Look for experience and customer testimonials before you make your choice. Also, it is advisable to check the fireplace models in their catalogues and to understand whether these will suit your home décor or not.